Below is a list of the remote control transmitter models available from Celadon. More models are always being added. Further details for the remotes below are available by selecting the remote control picture. You can also review some of the custom modification options for both low and high volume orders here. If you don't see a remote control model that fits your design requirements please contact us. There are many options for designing new remote control models, or adapting existing model designs. See here for further details regarding remote control types and technology. All the infrared remote control models will work with our infrared receiver line of products. If your application requires radio frequency remote controls (RF remote controls), we can also design RF receivers to pair with the remote controls (both external and internal RF receivers). Should your application require a custom remote control design solution, please contact us. Our remote control manufacturing facility, factory, engineering and design staff will ensure your design and manufacturing requirements are fully met. We have full capacity for new mold design and manufacture. Remote Controls sorted by maximum key count can be found here. 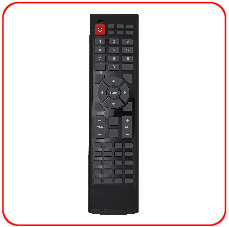 You can also view a chart of our remote controls sorted by maximum key and button count. Celadon remote controls and receivers are RoHS compatible, lead free products. Please note that Celadon offers some Low Volume Infrared Remote Control models (also noted below) for smaller orders, or for quick development and prototyping before committing to a specific design or model for a final product. The SH-15 remote control enclosure can be easily customized for a variety of applications. This model has a maximum of 15 buttons and uses a keypad overlay to remove any unnecessary keys from the layout. The keypad uses metal dome pads for improved tactile feedback and the battery door has a screw feature to secure the battery compartment. This model is available for both infrared and radio frequency applications. This model is available in low volumes as the SH-15A. - Programmable - The HRC-540A can be easily customized for a specific application or use at a specific hotel, motel or other hospitality property. The original remotes would be submitted to Celadon, along with a simple worksheet to define the button layout and graphic design. Celadon will provide samples to test and confirm the functionality of the device, as well as an artwork proof for the final design. Upon approval of the samples and artwork, Celadon can then begin to fill orders within a few weeks. Reorders can be made at any time! Available in lower volumes. Use as a replacement remote. Up to 54 buttons, custom overlays, custom programming using your original remote controls and your button layout design, custom branding (logos). Perfect for hospitality, hotel and other remote control consolidation applications. SC-33B: Perfect solution for prototype projects and low volume applications where unique infrared codes are required, or specific infrared code protocols are required. User selectable custom device ID and custom IR protocol. Choose from NEC, RC5, Sony, Toshiba, Mitsubishi and Matsushita infrared code protocols. Up to 33 keys/buttons, red feedback LED, 2 AAA batteries. We can work with you to create custom overlays and artwork for your application requirements. The SC-33B is a direct replacement for the SC-33A. Available in low volume.